Adel rolls in calls Sabrina the burrito. Adel explains the nickname, says everytime he gets a burrito there is so much “Sh1t” he doesn’t like and has to pick out. Sabrina gets up to leave but Jon tells her to stay. The chat about their games early on. Neda says she was really close to Heather week one but then they were distant for 2 weeks until Paul left. They talk about lying in the game, Sabrina says she only lied to Jon 30% of the time. Jon wants to have a debate. Sabrina Vs. Adel the topic is who is the best actress. Sabrina says Angelina jolie Adel says Julia Roberts. Sabrina gets called into the diary room. Neda starts making a big deal about them having to go over dates but they can’t because Sabrina is around. Adel tells them not to worry he doesn’t know the dates at all it’s going to be one on one Heather vs Neda. Adel adds that Sabrain kinda knows the dates but she will be gone. Adel says if Sabrina wins HOH she will put up either Jon/Neda or Heather/Neda. Heather agrees. They agree to reduce the amount of studying around Heather. Neda is going to spend some time alone in the HOH room and say she’s listening to music. Jon will hang out with Heather and block her. He will come up later tonight and quiz Neda. Neda says she needs the easter egg papers to help her study. Jon moves the picture of Janelle and says ask her anything she’s a teacher. Jon says Adel thinks he’s staying 100%. Heather feels bad that Adel will be on stage with his wallah bro shirt on. Jon tells her Adel wanted to get her out. heather can’t what she did for Adel to turn on her. Jon says it’s probably because he saw how good she did in the Ropes HOH competition. Sabrina standing brings up Adel coming up to her saying that everyone was choosing who they would marry and Adel choose Sabrina. i be sabrina misses deli next week….. sabrina will be lonely with out her one true love deli……. I wish Heather would confront Adel that she is voting to evict him because he wanted her out..Then he would find out what Jon and Neda are doing behind his back,and confront them in front of Heather. 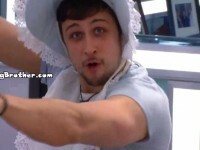 Also hope he finds this out and they lose his vote in jury.Hope this backfires on them!!!!! i think deli will be more pissed at neda and jon for him going to jury…… because neda and jon could have saved him without heather…….. so adel going to jury is a good thing for heather……..
Work has kept me out of the loop, is Adel going home..? If they screw over Adel, which looks like that’s gonna happen, I am officially changing my name on here and gonna start cheering for Sabrina! @sabrinasapig omg you just said my word. I would do the same too!!! OMG! I totally agree she’s a great player getting people to keep her this long even though they say they hate her. I’m amazed at how well she’s campaigned when she’s on the block she never gives up even when they tell her she’s safe. I feel sorry for Adel. NEDA JUST FUYCKED HERSELF—-DISRESPECTING NATIONAL ANTHEM WHEN SHE IS FROM IRAN??? (during the song and making faces??? )—-NO CANADA VOTE FOR YOU BYTCH!!! That POV was rigged, they should have to have a timer, so that people can see their times! 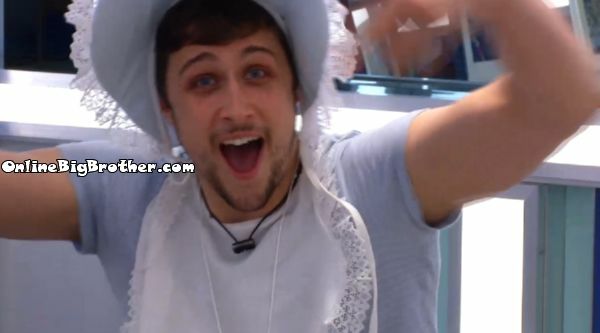 I AGREE THE VETO WAS RIGGED IN FAVOUR OF HEATHER LOOKS LIKE BIG BROTHER CANADA CLEARLY WANT HEATHER TO WIN! SEEMS SKETCHY THAT NOBODY SEES THE TIMER. REMINDS ME OF THE HOH COMP SHE WON ALSO LOOKED RIGGED WHEN RORO’S BUZZER DIDNT WORK. HEATHER IS NOT THE INNOCENT SWEET PERSON SHE WANTS VIEWERS TO THINK SHE IS. SHE WAS A LITTLE STRANGE WITH THE DIFFERENT VOICES AND ODD THINGS SHE SAID AND SHE BROUGHT ON THE WAY THE HOUSE GUESTS WERE TOWARD HER. but then I thought rachelle’s hoh comp was rigged (bungee cord not tightening for the first couple of times). fishy. the gold prospector comp smelled (everyone picks out up to 30 letters and Allison doesn’t get a single vowel?). fishy. the double eviction hoh’s smelled with two elimination quizzes in a row (a bb first I believe) the first one with the rachelle buzzer fiasco, the second one with the ‘random pairing’ of two people from the same side on the first round? fishy. the eyes puzzle hoh adel won was fishy. never before that I can remember have competitors been able to see the other people’s puzzles while actually competing. they are usually turned away to avoid the copy/cheating possibility for game integrity. fishy. the ropes/ water comp billed as endurance? fishy. endurance is defined by how long can you do something for… not how fast can you do it. strength comp of one man vs. three girls. true surprise it was as close as it was. maybe fishy. so why not this comp too? no timer. sounds fishy. 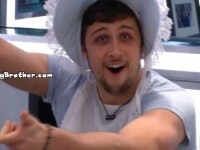 the feeds were down for five and a half hours and the winning time was 8:40? weird/fishy. The POV was not rigged. Why would they show the time? Have you ever seen the” Two-faced power of veto” competition BB7 where they have to match the faces and the fastest time wins or last year Bb15 “Keeping up with the Jones” where the house guest had to recreate a gallery on the opposite side of the wall. They revealed their times after everyone had completed the event. Unless you mean see their own times. In which case I agree their should have been a timer next to the twistos booth. i did mean see their own times. but I also meant reveal the times for all five players at the end and not just the winner’s time. in most timed bb comps that I have seen all of the times have been revealed on a board or by the person reading off the ‘scores’. Sabrina in the POV. “$1500, $700, I made $2300 in a few seconds.” Lmfao, and she was gonna be a lawyer! padding her rates already. not saying. just saying. I totally agree with you! But to be fair, no other BB setting has been so dry. They are constantly applying lip balms. They should have installed a better humidifying system. This dryness is causing the damp air that comes from their lungs to dry up in their nostrils. the plot to screw adel has been ongoing for two weeks. until jon won hoh the plan was to send adel packing. then jon got nervous of heather. he’s been banking on being the only physical threat to steamroll the women. looking back, I think jon’s dislike of Andrew stems from not being one of the testosterone squad. he didn’t like not being on the inside with the other alpha males of the game. must have bruised his ego. the alpha males usually all bond to form an alliance. must have been a shock when that didn’t happen. it shouldn’t be surprising that everyone is overlooking Sabrina. she hasn’t been a comp threat. her game is social. that’s why neda disrespects Sabrina’s game…. they play the same way (yes neda has won comps… when first arlie, then heather threw them) but her game has been more social by far. Sabrina and neda have played the same social game manipulating when they had power, and both have tried to appear the lesser threat to skate under the radar when they aren’t in power. I truly think the only difference in game between the two is neda is more consciously moderating her behavior because of the 24/7 cameras, whereas Sabrina speaks and acts in her outside personality regardless of the 24/7 cameras. adel had a pretty golden edit until marsha and his hoh speech. his edit even now has made me hesitant to predict Adel’s eviction…. even with everything that’s being said now I’m still unwilling to go more than 70/30 at this point. okay, maybe 80/20. my paranoia about production interference is probably part of this. I’m not shocked by heather felling betrayed by adel, I’m shocked she hasn’t clued in that for neda and jon to tell her about it means her nomination wasn’t last minute, and that her whole alliance betrayed her. if she stopped and thought she’d know the lies just keep on coming. I really really dislike Neda…. really disrescepting the Canadian national anthem, I get, that it may be a bit much for you to hear 10 thousand times a day… but….. you know you are being taped 24/7 be respectful, stand up, listen and smile and if it really bothers u, drop out of the race, go home, be it here in Canada or Iran or where ever you are from. as far as game, I wish someone would give you a Neda speech, in a language that only you could understand. Thanks for playing a great game, but you have proven to no longer be useful and now we just don’t have the numbers, so enjoy your time in jury house, but these house guest are going to hand her the money. just because. really Jon, can’t you use the 100k, wedding, pay ur parents some money really, and deli… nothing only 20k…. no wonder this season is neda…. gosh…. kick neda out, give the money to anyone else…. I’m agreeing that not standing for the national anthem is pretty disgraceful. it was jon and neda that remained on the beds and didn’t stand, right? Sabrina Abbate, a gorgeous full figured Italian female, that face, those eyes, hot ! She knows the game of Big Brother and how Its played. In the studying dates for HOH segment, Adel flat out says he doesn’t know any dates and it would be b/w Neda and Heather…why would you not keep him then?